The World Health Organization links air pollution to seven million premature deaths every year. Could the new “sneezometer” change this statistic? The “sneezometer” may sound like an invention from a Dr. Seuss book, or maybe something a cheesy superhero would use to fight crime, but that’s not the case. 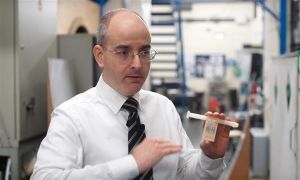 Instead, it’s a real invention from the University of Surrey that can help asthma patients breathe easier. The sneezometer is essentially an airflow sensor (also called a spirometer). The tool is sensitive enough to measure the speed of a sneeze. Spirometers measure lung capacity and are used widely to diagnose chronic and acute respiratory conditions like asthma. Up until this point, spirometers have been expensive, cumbersome, and not as accurate as physicians would have liked. The sneezometer tackles many of these issues. It’s ultra-sensitive and is able to measure the flow of air through a patient’s lungs. When the patient breathes through the fist-sized instrument, the sneezometer picks up tiny fluctuations in the breath’s flow rate, which may be caused by a disease. Because no such instrument has yet been available, researchers are still exploring the diagnostic capabilities. “Respiratory diseases are especially prevalent in developing cities such as Delhi and Beijing where air quality is a big concern. Air pollution was recently placed in the top ten health risks faced by human beings globally, with the World Health Organization linking air pollution to seven million premature deaths every year,” said Dr. Prashant Kumar, from the University of Surrey. The sneezometer is currently being trialled at King’s College Hospital, London. Here, the device may be used to help diagnose a range of conditions from neonatal settings through to animal diseases. The device could be in clinical service as soon as 2018.